backward compatibility with Triangle structure. Triangle's own emission (for light sources). Extension to Triangle to carry per-vertex colors. Definition at line 18 of file TriangleSetExt.h. t Reference to Triangle object to construct from. Definition at line 26 of file TriangleSetExt.h. References Triangle::radiosity, vertexColor, and vertexColorRaw. Definition at line 208 of file Triangle.h. 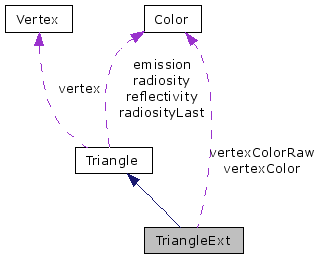 References Triangle::vertex, Vertex::x, Vertex::y, and Vertex::z. Definition at line 19 of file TriangleSetExt.h. Definition at line 20 of file TriangleSetExt.h. Definition at line 198 of file Triangle.h. Referenced by Triangle::centerOf(), and operator<<(). Definition at line 199 of file Triangle.h. Definition at line 200 of file Triangle.h. Definition at line 201 of file Triangle.h. Referenced by operator<<(), and TriangleExt(). Definition at line 202 of file Triangle.h.